On May 18, 2016, four exemplary projects/books on interior design, architecture, planning, landscape architecture, and urban design were named winners of the 2016 Great Places Awards—organized by the Environmental Design Research Association (EDRA) in conjunction with Project for Public Spaces. The EDRA Great Places Awards recognize professional and scholarly excellence in environmental design and pay special attention to the relationship between physical form and human activity or experience. This year's winning projects, selected by an esteemed jury of research and design professionals, will be on display during the 47th annual Conference of the Environmental Design Research Association on May 18-21, 2016, in Raleigh, North Carolina. 1. "An Outdoor Learning Environment for Children," the 2016 Place Design Award winning entry by Matluba Khan (University of Edinburgh), explores the Tulatoli Government Primary School, located in the sub-district of Raipura some 80 miles from Dhaka in Bangladesh. Like most government primary schools, the standard design consists of several classrooms, an office, a toilet block and a barren unsurfaced schoolyard. High dropout and low attendance rates are a main concern in Bangladesh, so the school authority was eager to work with the research team to view this issue from a different perspective. An anonymous donor sponsored construction costs, aiming to investigate how the design of a school ground can enhance learning and encourage attendance. 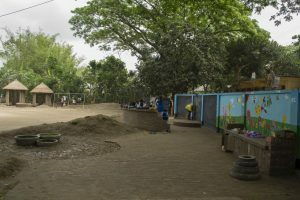 The project was theoretically grounded, participatory, and rigorous in its data collection, and results showed the positive impact of the design of the physical environment—particularly the outdoor spaces—on children’s learning, teacher motivation, reduced absenteeism and parent involvement. This research has the potential to impact school design in Bangladesh and other developing countries. 2. 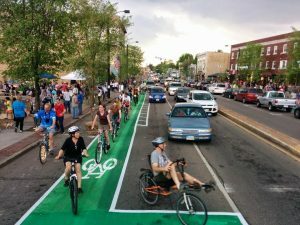 "Akron Better Block," is the 2016 Place Planning Award winner, submitted by Better Block co-founder Jason Roberts. Funded by the John S. and James L. Knight Foundation, this project served as a prototype for future street improvements planned for the North Hill refugee neighborhood in Akron, Ohio. Roberts worked with local activists Tina and John Ughrin, along with a number of neighborhood groups such as International Institute, Keep Akron Beautiful, AMATS, Boy Scouts of Akron, and Temple Square Properties to test the plan for the block and to give residents, city officials, and local stakeholders a view of what a complete street and an engaged community could look like. This project served as a catalyst for more permanent changes on the block and neighborhood. 4. 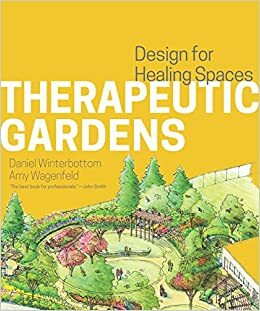 Therapeutic Gardens: Design for Healing Spaces, by Daniel Winterbottom and Amy Wagenfeld (pubished by Timber Press Inc.), is the recipient of the 2016 Place Book Award. This book discusses how therapeutic gardens reduce stress, improve treatment outcomes, and increase health and wellbeing for people of all ages and abilities. Therapeutic Gardens: Design for Healing Spaces, a case-study-supported instructional document, presents a collaborative approach and successfully translates the principles of therapeutic design into practice for designers, healthcare practitioners, and students. Using evidence-supporting place attachment and centeredness, coupled with global examples of successful therapeutic gardens, the authors demonstrate how gardens support learning, movement, reconciliation, mediation and memorialization, and improve health and social connection. 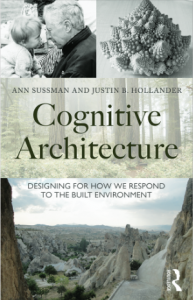 The book sheds light on how the combined strengths of multiple professions collaborating with common goals can provide tools to design meaningful and successful healing landscapes evocative of a deep sense of place. Using the latest evidence, the book positions therapeutic garden theory in a practical and scientifically valid context.